Recent studies in the history of Islamic science based on the discovery and study of new primary texts and instruments have substantially revised the views of nineteenth-century historians of science. 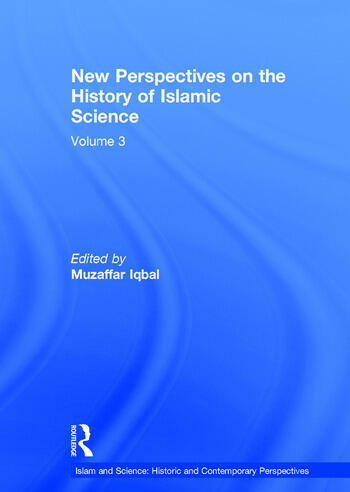 This volume presents some of these ground-breaking studies as well as articles which shed new light on the ongoing academic debate surrounding the question of the decline of Islamic scientific tradition. Contents: Introduction; Part I Theoretical Underpinnings: Reflections on some new studies on applied science in Islamic societies (8th-19th centuries), David A. King; Problems of the transmission of Greek scientific thought into Arabic: examples from mathematics and optics, Roshdi Rashed; Ibn Khaldun on the fate of Islamic science after the 11th century, Mohamad Abdalla; Between philosophy and mathematics: examples of interactions in classical Islam, Roshdi Rashed; The universe as a system: Ibn Sina's cosmology revisited, Syamsuddin Arif; Al-Quhi: from meteorology to astronomy, Roshdi Rashed. Part II Building Blocks of the Revisionist History: Al-Quhi vs Aristotle: on motion, Roshdi Rashed; The new astronomy of Ibn al-Haytham, Christian Houzel; The Configuration of the Universe: a book by al-Hasan ibn al-Haytham?, Roshdi Rashed; Lunar mansions and timekeeping in Western Islam, Julio SamsÃ³; An instrument of mass calculation made by Nastulus in Baghdad ca 900, David A. King; A pioneer in anaclastics: Ibn Sahl on burning mirrors and lenses, Roshdi Rashed; Causality in Islamic philosophy: the arguments of Ibn Sina, Syamsuddin Arif; The astronomy of the Mamluks, David A. King; Arabic versions and reediting of Apollonius' Conics, Roshdi Rashed; Nasir al-Din al-Tusi's revision of Theodosius's Spherics, Nathan Sidoli and Takanori Kusuba; Time, motion, distance, and change in the Kalam of Fakhr al-Din al-Razi: a preliminary survey with special reference to the Matalib ’Aliyah, ’Adi Setia; The universal plate revisited, Emilia Calvo and Roser Puig; The solar eclipse technique of Yahya b. Abi Mansur, E. S. Kennedy and Nazim Faris; Arabic science in 16th-century Europe: Guillaume Postel (1510-1581) and Arabic astronomy, George Saliba. Part III Looking Forward: History of science and diversity at the beginning of the 21st century, Roshdi Rashed; Name index. Muzaffar Iqbal is the founder-president of Center for Islam and Science, Canada. He is the author, editor and translator of twenty-one books on various aspects of Islam, its spiritual and intellectual traditions, Islam and the West, and the history of Islamic science. He is the General Editor of the forthcoming seven-volume Integrated Encyclopedia of the Qur'an, the first English language reference work on the Qur'an based on fourteen centuries of Muslim reflection and scholarship.